Humans and other vertebrates run fastest by minimising their contact with the ground. But the same isn't true of six-limbed insects, which run fastest when they have three legs on the ground at once, like a tripod. For this reason, engineers who build six-legged robots tend to use this tripod style - with two legs down on one side of the body and one on the other. But now researchers at the École Polytechnique Fédérale de Lausanne have questioned whether this is really the fastest, most efficient way for robot bugs to move across the ground. They used a simulated insect and an evolutionary-style algorithm to test many different combinations of walking style, eliminating the slowest. Their results show that a "bipod" style, where just two legs are on the ground at once, is actually the fastest way for insects to travel, even though no insects in nature walk this way. 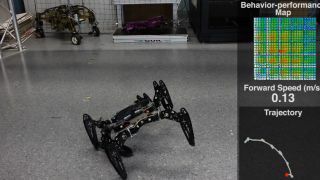 They tested their findings in the real world with a six-legged robot that could walk in both a tripod and bipod fashion. Sure enough, the bipod style was faster. Score one for technology. So has evolution failed real insects? Not quite. The engineers discovered that insects walk in a tripod style because they have sticky pads on the tips of their legs. Climbing vertical surfaces is easier when three of those pads, not two, are in contact with the surface. So while it's faster to go on the flat with two legs down at once, it's much faster to travel along vertical surfaces on three legs. They tested this by putting tiny polymer boots on flies legs, covering their pads. Sure enough, the flies began using a bipod-like movement to travel across flat ground. “This result shows that, unlike most robots, animals can adapt to find new ways of walking under new circumstances,” said Robin Thandiackal, a co-lead author of the study, which was published in Nature Communications.